The Prabhakar Post: Be Sceptical NOT Cynical....yet! Come January or February of every year, middle class India awaits the upcoming Budget,tax concessions or raise,train fare hikes,price of white goods and a whole lot of other expectations. The Investing community too turns crystal ball gazers,analysing and re-analysing the affect on the price of stocks and which Companies would benefit from whatever announcements happen. After the underperformance between 2010-2013 we have seen a superb return in 2014 in India post elections with the average return close to 40% annualized. 2015 will certainly be time for a reality check. 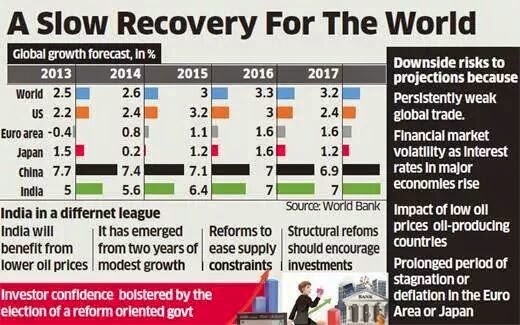 Most stocks have run up on expectations and the entire PR machinery of the BJP government has done a commendable job in tom-tomming the various positives.they have had marvellous luck with crude prices crashing leading to a moderation in inflation - the main components that have unsettled the Indian economy for so long. Looking behind the veil,exports are yet to pick up on MoM basis,the Current account deficit is still above comfort levels,local manufacturing is stuttering,hiring and new jobs across sectors are yet to firm up.If elections in the capital Delhi throw up a negative surprise for the BJP then the invincible looking Modi aura will suffer its first dent. The prononcements have come think and fast but there has really been no reform 'muscle' behind anything.Its begining to look like this Government is carrying on the policies of the previous regime which they so vehemently opposed. So should you be cynical ? Be a sceptic not a cynic yet as there is yet time for new policy measures. The Elephant may not be faster than the Dragon.It certainly is the more trustworthy!